Government is working on bringing in extra rolling stock for the CrossCountry franchise, while an engineering solution is being investigated that could allow Voyagers to operate along the Devon Sea Wall. In a Parliamentary debate on January 10, Labour MP Luke Pollard (Plymouth, Sutton and Devonport) highlighted that 30% of XC trains terminated at Exeter St Davids last November, because they could not pass Dawlish due to the weather. 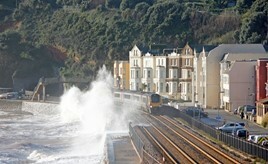 Class 220/221 Voyagers are unable to operate west of Exeter during bad weather, as salt water has been known to affect the electrics fitted to the roof of the trains. This was discovered when they were first introduced in 2001. For the FULL story, read RAIL 871, out now.